The Indianapolis-Marion County City-County Council meets tonight. The agenda lists a couple of items that caught my eye. Among those Proposals to be introduced, three stand out. Prop 162 would appropriate $150,000 to the Election board for legal expenses. The proposal does not say what prompts the need, just that the necessity has arisen since the budget was finalized last fall. It will be interesting to see what issue compelled the increased legal fees. Prop 163 and 164 are tandem proposals aimed at sweeping up the last debris left over from Mayor Vaughn's successful budget blackmail action of last fall; when he vetoed several line items in the Council-adopted 2013 budget. The former proposal reduces the approved budget by the amount vetoed (which targeted County Offices), while the latter proposal restores the targeted County Office budgets to pre-blackmail status. Up for a vote is one I had not followed and seems innocuous enough. Prop 108 would add one more appointment to the domestic violence fatality review team; this person being from a domestic violence response organization. There currently are 15 members, all of which appear to be appointed by the Council. According to the agenda, this proposal passed out of committee by a vote of 7-0 and was passed by the full Council 29-0. And yet, it was vetoed by the Mayor. Go figure. This will be interesting, particularly to the point of who votes to override the veto, and who does not. Prop 105 would establish an Economic Improvement District for the Fountain Square commercial area. This would allow the collection of an extra tax based on street frontage. The extra tax was approved by a majority of those affected. After 5 years, another vote of those folks would decide if the EID would be approved for another 5 year stint. At the 10 year mark, a new petition would have to be circulated to see if there was continued interest in the area. Prop 133 is yet another abatement, or two actually, for Eli Lilly. This proposal would approve a 10 year real property abatement and a 10 year personal property abatement for new construction and equipment at their 1555 Kentucky Avenue and 1223 W. Morris Street facilities. There was much controversy over whether Lilly met its obligations for job creation and investment a couple of years ago in a previous property tax abatement deal. This time they are not adding any new jobs and will either transfer 175 current employees or use contract workers. They are also using vigorous hedging language to estimate the actual investment dollars and expected completion dates. With all the hedging, one surely must wonder if anything in these new abatement deals are anywhere near legally binding. Now, Prop 141 is the best proposal of the evening. This one was initiated by Councillor Vernon Brown, cosponsored by Councillor Christine Scales, and significantly added to by Councillor Zach Adamson. Brown reintroduced the creation of a fund which could be used for public safety recruit classes. This was passed by the Council last year and was vetoed by Mayor Vaughn as part of the blackmail vetoes. Brown makes a valid point in reintroducing this measure - that if public safety is truly the Mayor's top priority, then recruit classes or training of experienced, but newly hired, officers and firefighters is a must. 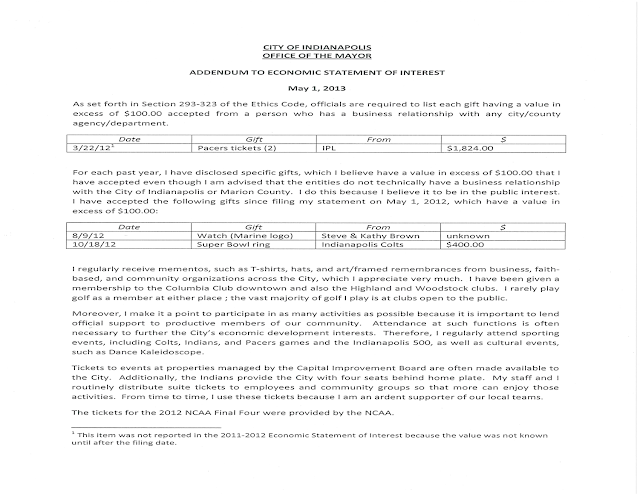 Adamson added that $6 million from RebuildIndy money should be appropriated to the fund - the same amount that is being dedicated to the dubious cricket park on the eastside. That addition is poetic. Greg Ballard, elected Mayor of Indianapolis, has steered our City into a losing combination of increasing violent crime, worsening parks, and worsening public health. But, hey, his campaign contributors are making out like bandits. Congrats. Today's newspaper shows what happened because of the ill-placed priorities of this administration. Violent crime is up - number of cops are down. This even after former Mayor Peterson raised taxes for public safety; killing his chances for reelection and handing that election and ample funds for public safety to the unknown Ballard. Parks have been for sale under Ballard, and we see the effect - Indy's park system ranks 47th among the Country's largest 50 cities. Ballard has put Parks on the endangered services list - first trying to sell them off, then leasing them out to the point regular folks can't use their own parks, and cutting back on maintenance. Most recently, Ballard, demonstrating the epitome of cluelessness, is spending millions of dollars to turn a neighborhood park into a privately run cricket venue. And, Indy ranks 45th of the 50 largest cities in overall health. Not enough money for sidewalks and parks - but plenty of money for Angies List and Eli Lilly and Rolls Royce and generous campaign contributors. The money this City and County generate has been going into downtown - to the detriment of the outer Townships (and outer Center Township) and basic services. TIF districts continue to balloon, thanks to politicians from both parties, decreasing the revenue available for the quality of life services like Parks, police, and healthy, walkable neighborhoods. Campaign contributors have been making out enormously well, though, with the city taxpayers not just sweetening deals, but underwriting the lion's share of deals - the Broad Ripple garage, the North of South (City Way) deal, the Bank One Ops center deal - the taxpayers have been on the short end of the stick in all of these deals with the super sized investments. The Mayor even turned down one proposal for the Mass Ave fire station property that did not ask for any TIF money so that a well connected firm could get the lucrative deal. Ballard was not elected Mayor of downtown. His performance needs to be judged by the entire City. By that standard, Ballard is a failed Mayor and we are a failing City - not a world class City, but a failing City. Congrats on this ignoble trifecta, Mayor Ballard. The mystery of the Value of the SuperBowl ring has been solved by IndyStar's City Beat reporter, Jon Murray. 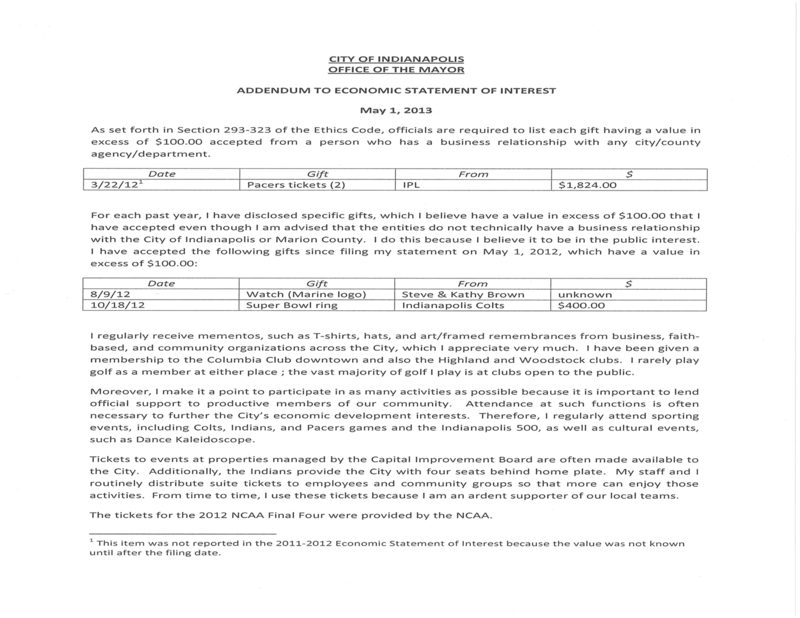 As you will recall, Gary Welsh of Advance Indiana, discovered a gifted Super Bowl ring, reported by Mayor Greg Ballard on his 2012 'Statement of Economic Interest' form, was valued at only $400, when such things normally go for $5000. Seems the rings a commemorative reproduction. Here's a link to Murray's piece, so you can get all the details from him. In this week's IBJ, guest columnist Louis Mahern makes a remarkably compelling case for Mayor Greg Ballard and City-County Council President Maggie Lewis, to disclose all of the gifts they get. Since 2008, Ballard has received nearly $1 million in free sports tickets. Shouldn’t he have to report somewhere that he received those tickets as well as their value? Wow ! I knew he got tickets, but that's a load of tickets. If Mahern's figures are over 5 1/2 years, that's $181,000 a year in TICKETS. A lot of feting can be done with that budget, and none of it has to come from Ballard's campaign coffers. Ballard mentions that he attends sporting events and that the City often gets tickets to other events from the CIB. He does not actually disclose the number and value of the tickets he gets. Of course, since Ballard already has a suite at the BLF, why accept 2 Pacers tickets worth $1824 from IPL? Gary Welsh, over at Advance Indiana, has already exposed the huge undervalue of the Super Bowl ring, which Welsh shows is really more like $5000. Back to Mahern's IBJ column - Not only were the tickets not fully disclosed, but memberships in country clubs, and his frequent, free, foreign jaunts are also not disclosed to the public. You will recall how Ballard says his administration is transparent. Well, here's a great example of how opaque they really are. Except for Campaign Donations, Subject to IC 3-9-2 and Reported in Accordance With Law or Gifts From Persons Including Family Members With Whom You Have an On-Going Social Relationship Not Related to Service on the Council Which are not Subject to Reporting on this Form, Did You Receive any Gifts, or Other Items, Valued Over $100, or in the Aggregate Over $250, in the Prior Year From any Person or Firm that Does Business With or Seeks to do Business with the City or County or Which Seeks to Influence Council Action? The public has a right to know how much our elected officials get in gifts from admirers and influence seekers. In fact, I'd like to see Departments heads also have to disclose gifts. The Council and the Mayor like to tell the public that they have strong disclosure and ethics statutes, but Mahern has shown us that they either have weak statutes or they ignore what they have at will. Make no mistake: Ballard and Lewis are powerful officials whose friendship the Colts, Pacers and private contractors crave. It turns out the Commission on whether or not the Homestead Credit should be eliminated has the same agenda every night. This includes a presentation by Policy Analytics and another by City Controller, Jason Dudich. The Commission webpage provides links to the two PowerPoint presentations as well as a report by Policy Analytics. Wednesday, June 5, 2013 (6:00 p.m.) Warren MSD Education and Community Center, 975 N. Post Rd. A final meeting will be held on June 24, beginning at 6 pm in room 118 of the City-County Building.